I wake to the sound of wind battering the shutters and linger under the billowing white mosquito net. Listening to it howl outside the house stirs a cocktail of excitement and nervousness. I think about the forecast; 13-foot seas and 30 knots isn’t something to be taken lightly. Anticipation of the forecast is visible among my teammates as we roam around our shared house and gather our belongings on the morning of the start of the Caribbean 600. I go easy on the coffee, which never helps my nerves. We have high goals and expectations for this race, which adds to the stress. Given the forecast, there’s a chance we can beat the record, but our objective is to beat Rambler 88, the big American maxi, across the finish line. 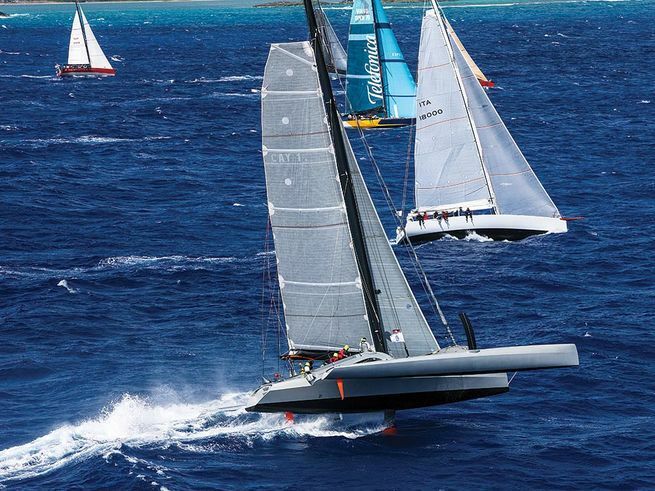 We have a strong desire to win overall because the Caribbean 600 may be the last major race for Paradox. The likelihood of stars aligning is slim, however, and our margin for error decreases as the wind strength builds. Soon enough, boat covers are off, sheets led and we’re casting dock lines. We could use another sailor or two given the expected conditions, but a last-­minute crew addition is too much to organize. We collectively leave concerns about being shorthanded next to our flip-flops on the dock and motor to the start. Our six-pack crew includes Paradox’s owner, Peter Aschenbrenner; our skipper, Jeff Mearing; navigator Jonny Malbon; Paul Larsen, aka the world’s fastest sailor; Helena Darvelid; and myself, trimming, and running the pit. For reference, Rambler 88 has 18 crew to our six, but we have strong assurances in our favor. We know the boat intimately, having sailed thousands of miles and many races together. We’ve pushed the boat hard before, especially during the 2015 RORC Transatlantic Race, which had five straight days of white-knuckle downwind charging, continuously touching 30 knots and more of boatspeed. We know Paradox, a Nigel Irens-designed racer/cruiser built in 2010, is strong. 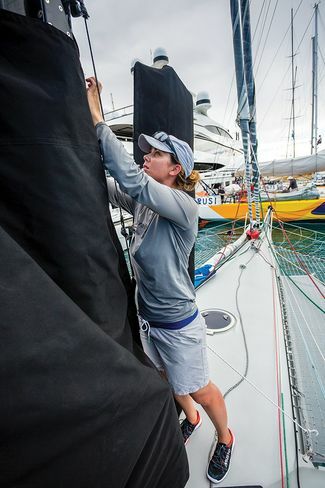 A race-committee delay ­following the first start, to wait for squalls to roll through, is puzzling because the conditions match what we expect to experience over the course of the entire race. It’s blowing a steady 26 knots and 35 in the squalls. We know what we’re getting into, but I’m worried many of the other competitors do not. I’m a fairly cautious individual, and if I were on many of the boats I saw gearing up for the start, I wouldn’t have left the dock. 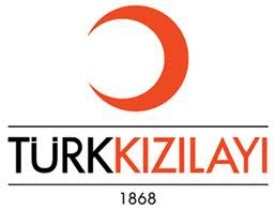 The sea state and the squalls are going to be horrendous, and conditions will be boat-breaking, which often equivocates to people getting injured. Humans break before carbon fiber does. Adrenalin and concentration soon replace the waning anxiety. It’s time to get a good start and sink our teeth into what will be an epic race. It’s time to shift into a lower gear and dig deep. We settle for a full-speed charge at the start line on starboard near the committee boat and then tack immediately after we cross the line. Every monohull in the fleet had started before us, so we need to create some space and open ­runway to the first turning mark off Barbuda. The elation of getting thrown into it straightaway is extraordinary. We’ve been dreaming about this race, and the conditions on the racecourse are exactly what Paradox is built for. We take unadulterated pleasure in passing nearly every boat ahead of us. Around the top of Antigua, while beginning the reach to a mark off Barbuda, we pluck off the fastest remaining boats one by one: the maxi Proteus, the Volvo 70 Warrior and then, finally, Rambler 88. I give an enthusiastic wave to the crew on Proteus as we blaze past, hoping it’s the last we see of them until we’re ashore with a beer in hand. After its recent refit, Rambler 88 now draws 23 feet and is about a ton and a half lighter. We anticipate the race being a 600-mile game of snakes and ladders with Rambler, which we expected to be the better boat upwind, but we’re confident we’ll get the best of it on the reaches. Now, about those reaches. We’re continuously touching 30 knots or more of boatspeed here. That’s wet. Very wet. The pressure of the spray on your face ranges from a tolerable annoyance to an outright smack. The smack is followed by a gasp for air and a head shake, and a continuous dribble of salty spittle down your chin that you continuously eject. The inside of your top and bottom lip becomes pruned, as if you’ve held a salt cube inside your lips for hours. At times it’s both exciting and fear ­inducing. My emotions are in sync with the trimaran’s heel. Heel angle dictates whether or not it’s an orifice-clenching moment or exciting acceleration. Racing at such a high level, you’re always going to be pushing the edge. We can’t afford to take our foot off the gas pedal with Rambler 88 only a few miles behind. That is, of course, until the gas pedal gets taken away. Though we didn’t really heed this ­philosophy until two-thirds of the way around the racetrack, there are moments when we simply must slow the boat down. Especially in this amount of wind, the sea state, the squalls, all of which take a toll on the equipment. Stuff breaks, right? The first piece of gear to fail is one of our winches. Paradox has two winches in the pit on either side of the center hull and no way to cross lead lines, so it will be an issue if not sorted soon. I begin to accept that there’s no way we can maintain our lead if we are down a winch. But it also isn’t the best time to have Jeff go below to try and fix it. Things are getting very windy on the back side of St. Kitts and Nevis as we work our way toward Saba. We avoid the wind shadows but fight our way through numerous squalls. In one huge acceleration, we spin out into a crash jibe. Time to tuck in the third reef and deploy the storm staysail. We recover quickly and carry our new sail combination to Saba. But then we struggle on the upwind leg with our small foresail. It’s time to peel back to the staysail. The wider-than-average reach angle from St. Barts to Guadeloupe is where we can lay some track and possibly pull away from Rambler, which is less than a mile away at times. Off we go, thundering into the black, moonless night. The night is made darker inside my tinted goggles, but from where I reside, holding on to the traveler control line in the cockpit, I can still see the numbers and the angle of heel. That’s all I need to see. I’m camped out on the traveler while Jeff and Paul take hourlong turns driving. I have as few wraps on the traveler winch as possible, so I can dump it quickly, holding on to the abrasive sheet as tightly as possible. Enter my world for a moment. I’m ­terrified of getting washed overboard by a wave, so I’m clipped in forward. My role with the traveler is to control the boat’s heel, which means I’m the safety backup to the driver. Think of it like cutting the fuel line to the accelerator. I have a sense for people’s comfort level and driving style; Paul likes to push it, so I don’t dare deny fuel to the fastest sailor on the planet. Yet even Paul has a tipping point. Literally. We shout back and forth to each other over the noise produced by the speed. I have as few wraps on the traveler winch as possible, so I can dump it quickly, holding on to the abrasive sheet as tightly as possible. My fingers begin to ache, but I can’t switch hands because I’m using the other one to hold on tight. The pelting spray makes it hard to take a breath, so I tuck my chin for a clear pocket of air. With my chin tucked, spray now penetrates the goggle’s top vents and I have no free hand to clear the salt from my eyes behind the goggles. I’m sitting, precariously perched, with one leg outstretched to a foot brace. After a while my leg starts to quiver violently and I can’t tell why. Fear? Cold? Fatigue? Combination? I read recently that it’s a way for the body to release adrenalin. I’ll buy that. I hold out as long as I can on my perch but max out at three hours. The race is long, but if I’m sleep deprived, I can’t perform at 100 percent, the boat’s performance suffers and my role is diminished. I yell for someone to swap with me. It’s my turn for a break. The boat’s interior looks as if we’ve had a water-balloon fight down below. I’ve never seen Paradox’s cruising interior in such a state of disarray. On longer races we pay a great deal of effort to keep it livable down below, but all rules are off in a mad dash of 600 miles. The tedious process of going off watch begins by removing the tether, then PFD, hat and goggles. Latex wrist seals peel over chapped hands, and the latex neck seal is gnawing through the skin on my neck. It’s painful, but it’s actually much worse when putting it back on. I go to grab a nap, but it’s not a good one. I dream about the peanut butter and jelly sandwich I made myself before leaving. I wake when I sense the boat has come to a complete stop. It’s sunrise, and we’re only doing 10 knots, wallowing in the lee of Guadeloupe. 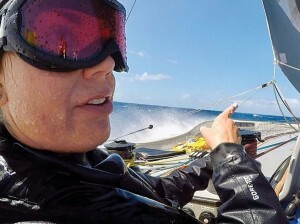 The long reach down to Guadeloupe, and whether you get to play through or sit wallowing in the island’s expansive wind shadow, are two of the most anticipated markers in the race. The slowdown lasts long enough for Helena to strip her kit and hang it outside to air. But soon I see a dark ripple of pressure ahead and help her to pass everything back down below. We’re about to get wet again. At this point, we are ahead of the record, but as we plod along near Guadeloupe, the record slips away. By our later calculation, we managed an average of 17 knots to Phaedo’s record-setting pace of 19. Not bad, considering we still had our cushions to sleep on and a working refrigerator, stove and shower. As evening falls, we set a gennaker for a run to Redonda. I take another opportunity to recharge and hit the bunk. I study the back of my eyelids to force sleep, but Jonny soon wakes me with a shout that we have a complete electronics blackout. Barreling along at 24 knots toward the looming dark mass known as Redonda without instruments for radar is disconcerting. Jonny and Jeff have performed numerous repair miracles during the race, but this one will be a biggie. Our electric winches are still working, ­fortunately, allowing us to furl the gennaker and get the boat under control. We slow the boat and give our wizards time to work their magic. While they do so, Rambler is drawing ever closer. Only a 30-mile beat to the finish remains. We later estimate that we spent more than an hour of slowing to 6 knots or less to deal with different issues on board. We can only hope that everyone else is dealing with breakages. This much we know: Conditions aren’t being kind to the fleet. Of the 84 boats that started, 41 of them will retire. We cross the finish line first after 37 hours on the course, returning as happy, albeit broken, sailors. We’d set a few lofty goals months before, which included, in order: Fly to the Caribbean. Beat Rambler around the Caribbean 600 course. Win cask of rum. Consume cask of rum with friends.